Following an auto accident in California, you may be wondering what negligence is and how can you can prove the other driver is responsible for your harms and losses. 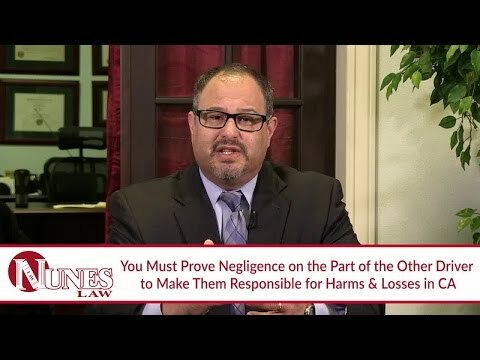 Negligence is described as carelessness derived from someone else’s actions, and determines whether or not they were responsible for a particular situation. An example to illustrate this would be if someone is driving too fast and cannot stop in time to avoid hitting the car in front of them. The driver is deemed negligent in that situation. If you believe your harms and losses following an auto accident resulted from the carelessness of another driver, you may have a viable case. Watch the video to learn more. If you have additional questions regarding negligence and how to prove someone else is responsible for your harms and losses, I want you to call me at (559) 436-0850. I welcome your call. Visit our educational website at www.NunesLaw.com for more videos and media content from our law firm.